Since this is the Batman Cycle, we wanted to pay tribute to one of the most famous Batman actors of all time, Adam West! His campy portrayal of Batman was often called "The Bright Knight" and made Batman and Robin fun to watch for the whole family, as opposed to the dark, brooding, and gratuitously violent Batman we currently have in Batman v Superman. The workout is 25 minutes long, which was the actual run time of the Batman TV series, and the reps for the first 4 movements correlate to the initial air date for the series on January 12, 1966. 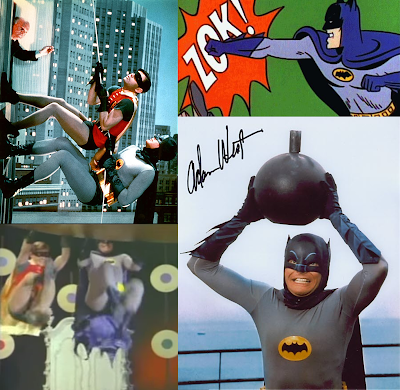 Most of the movements have some correlation to the Batman TV show, the obvious ones being the rope climbs and the overhead bomb run ("somedays you just can't get rid of a bomb!"). The push up variations represent the infamous punching that was always accompanied by words describing their impact spontaneously materializing out of thin air! And the toes to bar represent the swinging kicks that were often seen in many Batman fight sequences. The double unders don't represent anything, that was the only movement I could pick where doing 66 of them per round wouldn't be ridiculously hard... Have fun tomorrow and remember we're doing this in memory of Adam West! In memory of "Adam West"